Cool autumn evenings, clear starry skies, singed hotdogs and get-togethers around the glowing embers. It’s in our nature to gather around the fire, a primal desire extending back to the dawn of time when the world was a cold, dark place. The flickering flames and crackling logs sooth and warm. Below are some basic principles and design ideas to get you started on planning your custom fire pit. 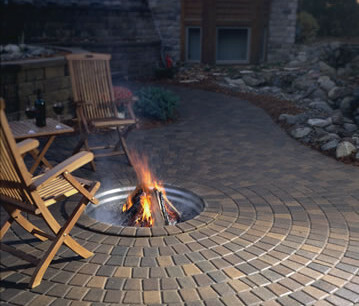 A few things to keep in mind when planning your fire pit…not complicated, but important. • Containment — The whole idea of the fire pit is to contain the fire. Non-combustible materials are mandatory. • Safety — Make sure the location you plan to place your fire pit should be at least ten feet from trees, shrubs, patio furniture and your house. Sparks and cinders ejected can start a blaze where you don’t want one. • Air — Fire requires oxygen. Make sure the location has plenty of ventilation or your fire will fizzle and smoke, driving guests away from your creation with tears in their eyes. The most basic fire pit is a hole in the ground. Aesthetically, you will want to line the interior with your preferred containment material. Rock, stone, pavers and concrete are frequently used. As an added touch, ring the top of the pit hole with more rock or pavers. Make it large enough that a fire built in the bottom will have adequate airflow down the sides to burn. Raised fire pits are popular because they allow people to gather close while seated in chairs and provide more warmth as your guests can snuggle closer while the heat rises above them. These are the most popular types of fire pits. The ground level pit is popular with those who prefer a campfire atmosphere. Construction and aesthetics are similar to the raised pit but the sides are not as high. Make sure the keep area trip free since the sides are lower to the ground. Free your imagination! This is your creation. In future years, when the flames crackle and your friends gather near, you will bask in the glow of the fire and the warmth of good times. For more information contact Increte of Houston here or call us at 281.499.3990.